Nonresidents are only taxed on their Panamian-sourced income. Married couples are generally taxed separately but they may opt for joint taxation. Income earned by nonresidents is generally taxed at a flat rate of 15% on gross income. Rental income is taxed at progressive rates. Individuals who earn rental income can deduct the following from their gross rent: municipal and national taxes, maintenance and repairs, administrative expenses, and depreciation of the property. Taxable capital gains are calculated by deducting the following from the property value at the time of disposal (selling price or market value): acquisition costs, improvement costs, and transaction costs. Capital gains realized from transactions that are part of ordinary business activities are taxed at the standard progressive income tax rates. Leasing immovable property in Panamá is subject to VAT, levied at a flat rate of 7% on the gross rent. Entities with an average monthly turnover less than US$3,000 (during the previous tax year) and an average yearly turnover of US$36,000 are exempted from VAT. 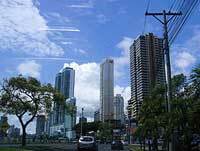 Real estate located in Panamá, whether urban or rural, is subject to property taxes. The tax base depends on the total value of the land, plus all improvements, as appraised by Land Commission (Oficina de Catastro). Real estate transactions at prices above the appraisal value automatically increase their value for tax purposes. 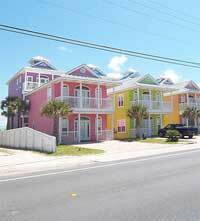 The property tax is imposed at progressive rates. Income earned by companies is taxed at a flat corporate tax rate of 25%. Income-generating expenses are deductible when calculating taxable income. Capital gains realized by companies from transactions that are part of ordinary business activities are taxed at the standard progressive income tax rates. Capital gains realized by companies from transactions not part of ordinary business activities are taxed at a special flat rate of 10%. A 3% withholding tax is levied on the transaction, which will then be credited against the taxpayer's capital gains tax liability. Tax is one source of financial growth in a country. Tax calculated in different basis according to some countries. Tax has different type and one of it is the capital gains tax. But in some countries they do not have these capital gains tax in some reason. Get a short term loan to pay for things while you are waiting for a pay increase.